The Technical Reference Manual mentions that operation of the Model II without the Disk Station requires an "External Terminator Plug" for relable operation. But any information on this device is missing. And some Model IIs appear to operate properly without it. 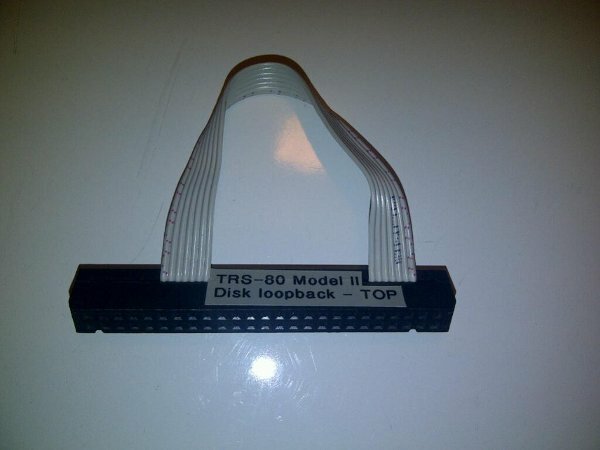 See Model II card inventory for the FDC boards that need a loopback. Combining information from the vintage-computer.com vcforum, Technical Reference Manual and the Technical Bulletins sheds some light on this elusive plug. So actual termination is not in the plug, but routed back to the internals of the Model II! 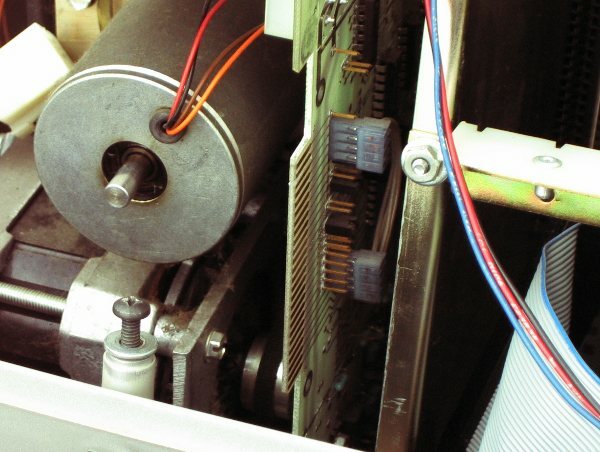 The documentation on the floppy drive internal to the Model II can connect the even pins 34-40 to terminators. This is configured by a small cable, just visible next to the card cage on the drive board. The two light blue connectors short the pins to internal terminating resistors. So the signals DIR, STEP, Write Data and Write Gate, originating from the FDC card travel on pins 34-40 to the internal drive and the external drive plug. At the plug, they are connected to the otherwise unused pins 4-10. The signals travel back to the internal drive where they are terminated. The pins 4-10 are not used for single sided drives, bit pin 10 is used for side select. So this issue had to be resolved before these could be used. This actually happened with the "Late Design FDC", which had separate connectors for internal and external drives, where the internal drive was terminated on the FDC board. Pin 10 now could be used by the Side Select signal without shorting it to the Direction Select at pin 34.